It took me awhile to find this bit of trail (shown as red line on map) in northern Marin County. I walked north, up Hamilton Drive, to a point where the road made almost a 90 degree turn to the Right (right after the Starry Night Winery, and California Rice Oil across the street). At this point, I made a 90-degree Left turn, onto a paved asphalt bikepath and walking trail. I followed this trail (which ran roughly parallel to the railroad tracks and Highway 101 North), to Highway 37. I walked underneath Highway 37 (where I saw many mud-daubed birds nests (shown), clinging to the underside of the freeway overpass). After walking down (Hanna Ranch?) Road, to the end of the freeway entrance area (shown), as far as I could go, I turned around and walked back the way I'd come. 19 little brown jobs (LBJs); 1 bumblebee; 3 bicyclists; 2 lizards (plus a few blurs in the bushes that I suspect were additional lizards, but I can't be sure); 12 barn swallows; 5 red-winged blackbirds; 4 ducks; 1 couch; 1 turkey vulture; 1 mockingbird; 1 dove; and 3 unidentified flying bugs. Starting at Pacheco Pond, I worked my way west along Bel Marin Keys (double yellow lines on map). I was able to photograph a lizard enjoying the last few moments of sun on a rock by the pond. And I was able to take pictures of a swan (shown) and some pairs of Canada geese (shown in a blurry picture to the right with four goslings, although the latter are almost impossible to see in this picture). The presence of goslings probably explains why the Canada geese were chasing away the swan. As dusk approached, it was time for the mosquitos to come out at Pacheco Pond, particularly at the northeast end. I found myself walking and swatting at the same time. To those in passing cars, I'm sure I looked like a very strange person. By the time I reached the commercial end of Bel Marin Keys Blvd., it was getting dark. I walked by Cafe Bowl of Sol, Pug Snuggly, Who Does Your Dog, and other fun small businesses, that were closed for the evening. And I passed by Arroyo San Jose (creek shown). I finished today's walk when I hiked to the top of the overpass that was part of the Highway 101 interchange, and looked around to find the trail (beginning of short red line shown on map, heading north). However, all I could see was some overgrown railroad tracks below. Perhaps this is the trail? I'll have to come back later to find out. 1 lizard on rock; 1 dove; 24 mosquitos (1 was biting my hand! ); 5 barn swallows; 10 Canada geese + 4 goslings; 1 large white swan; 7 ducks; 3 clouds of gnats; 6 red-winged blackbirds; 9 little brown jobs (LBJs); 1 great egret; 2 crows; and 1 tennis ball. Today I had a chance to see how much the old Hamilton Air Force Base has changed. It took me awhile to decipher the map; I parked at the Novato skateboard park, instead of the trailhead parking lot for the Vista Trail up Reservoir Hill. But, this extra stretch of walking gave me the opportunity to notice another trail as I walked down Hamilton Parkway -- which I explored on the way back. The climb to the top of Reservoir Hill yielded a sweeping view of San Pablo Bay, and the hangers (now occupied by businesses), and housing below (pictured right). It was also a good day for wildlife. Several American avocets swept their bills from side to side feeding in the shallow water (pictured right). Canada geese had paired off (pictured right). Little brown lizards were out sunning themselves and went skittering into hiding when I approached. There were large patches of red clover, purple lupine, and orange California poppies, and several other wildflowers in bloom. 13 barn swallows; 26 little brown jobs (LBJs); 7 lizards; 2 crows; 1 ladybug; 1 white butterfly; 4 Canada geese (2 prs. ); 6 red-winged blackbirds; 9 ducks; 1 unidentified flying bug; 2 swarms gnats; 3 reddish finches; 14 American Avocets; 1 unidentified brownish shorebird; 1 snail; 1 bumblebee; 1 hummingbird; lots of wildflowers; and 1 house with 13 (!) barn swallow nests under the eaves. The Las Gallinas ponds were alive with several different birds, taking off and landing, and just floating about. (Thank you to Rosina for pointing out the ducklings.) I walked the large loop, and out to the end of the trail (the straight line that extends up toward Hamilton Wetlands Restoration area, and ends at a concrete barrier. I then retraced my steps and walked the smaller "inside" loop. The day belonged to the red-winged blackbirds -- that were warbling and singing up a storm. They were everywhere - perched on cattails, bushes. One (pictured at right) posed on top of a warning sign (stating that ponds contained effluent water). into the underbrush, and maybe occasionally hopping onto low branches. This one might as well have climbed Mt. Everest as far as I was concerned. I have much to learn. hawks/falcons; 2 mockingbirds; 8 orange and brown butterflies + 3 white ones; 3 turkey vultures; 1 great blue heron; 1 bumblebee; 40 barn swallows; 1 kite; 1 crow; 3 unidentified flying bugs (UFBs); 2 smaller yellow birds (finches?) and 2 reddish birds (finches?) up on utility wires; 1 dove. Someone pointed out where they saw an otter, but I didn't see it. Several cows were munching grass in the distant background. It was a beautiful spring day today. The hills and grasses are still mostly green, assisted by lots of rain this year. Even so they'll start turning the color of dried straw in a week or two. I worked my way West to East today -- walking first up the Redwood Highway (a frontage road to Highway 101, shown as double yellow lines above on the map). I was surrounded by cicadas making noise for a few minutes. I was only able to find/see two of them; but it sounded like there were many more "singing" to each other. I also passed a number of interesting looking small businesses. Several catered to pets, with promises of luxury cat boarding; bed and biscuits for dogs; and other services. Next, I then followed the trails (red lines) to John F. McInnis Park -- where there were lots of birds, and flowers in bloom. There were kayakers on the water, and several people out walking their dogs. I walked around the first of two large loop trails (the bottom of the two). I'll walk the upper loop next time. I also felt like I was living in a Dr. Suess book today, as I saw a vole in a hole (pictured), some quail on the trail (also pictured), and a duck in some muck. I did not see a cat in the hat, until I came home; and there I discovered one cat sitting on/in my hats. 2 Cicadas; 9 clouds of gnats; 33 little brown jobs (LBJs); 13 crows; 1 lizard (+ two blurs in bushes that were probably lizards); 20 ducks; 11 quail; 4 turkey vultures circling overhead; 1 mockingbird; 2 blue jays (without crests); 2 balls in water (1 tennis and 1 whiffle ball); 3 unidentified little flying bugs (LFBs); 2 doves; 13 red-winged blackbirds; 1 vole in hole; 26 sea gulls; 10 black-necked stilts; 6 American Avocets; 25 unidentified brownish shorebirds; 8 black beetles; 4 killdeer; 1 kite hovering about baylands; 1 tern? ; 6 big fat black and yellow bumblebees; 1 orange and brown butterfly/moth; 1 snowy egret; and 1 (dead) fairly large (almost 3 feet long) brown snake. 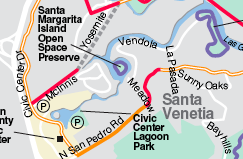 Start and End Points: Lagoon Park, and various other locations in Santa Venetia, CA area. 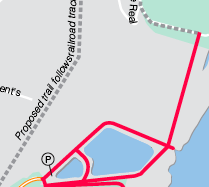 Today I followed Civic Center Drive North until it became Redwood Highway; made a large loop out McInnis Parkway (shown as solid red line on map) and around the peninsula and back (on a trail not shown on this map), circling the lagoon in Civic Center Lagoon Park. 1.) Santa Margarita Island Preserve (small purple circle on map) is a fun small island tucked away from sight; and 2.) 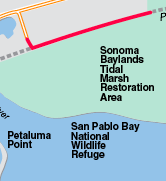 Santa Venetia Marsh Preserve loop (purple dog-bone shape loop), is near Gallinas Creek/San Francisco Bay. For more details on these two preserves, see bahiker.com or local city park descriptions. They are both hidden away in residential neighborhoods. The Civic Center Lagoon Park, is across the road from the Marin County Civic Center (shown), and near the "Field of Dogs" dog park. The Park and the lagoon are quite large, and the lagoon is filled with ducks, sea gulls, pigeons, Canada geese, a few cormorants, and other birds. I saw my first duckling of the year today at this park (pictured at right). With children chasing birds around, and other hazards there, I hope the little ball of fuzz reaches adulthood. 16 crows; 58 pigeons; 105 ducks (includes 1 duckling); 69 sea gulls; 25 Canadian geese; 5 red-winged blackbirds; 3 cormorants; 25 little brown jobs (LBJs); 1 great egret; 1 large hawk circling overhead; 1 blue jay; 1 lady bug/bird; 1 white butterfly/moth + 1 brown butterfly/moth; 3 lizards (plus a few blurs in bushes that I suspect were lizards, but I can't be sure); 1 hummingbird; 1 snowy egret; 1 little brown rodent (vole?) who stuck his head out of his hole in the trail -- which was probably ill-advised given the large number of dogs walking in the area; and 1 hubcap along Civic Center Drive/Redwood Highway.